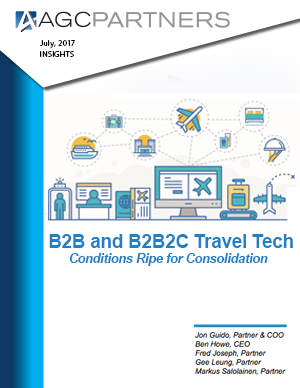 We are pleased to share with you our latest Insight on B2B and B2B2C Travel Technology. The global travel technology market, estimated at over $10 billion in size today and driven in part by the rapidly-growing ~$8-trillion travel and tourism industry, is expected to experience continued growth as consumers and businesses alike increase digital adoption. With nearly 100 companies identified in AGC’s travel tech landscape, this industry is large and growing and contains many innovative companies disrupting traditional trends. Travel tech solutions revolve around automation, on-demand functionality, and hyper-personalization to create a seamless traveler experience. Financing activity in private travel tech companies has increased in recent years, with over 20 transactions occurring annually, while M&A activity has held steady, with the majority of activity coming from larger tech-oriented companies. This report takes a closer look into the various technologies being used, and also examines the market, the companies in the ecosystem, and recent M&A and private placement activity.